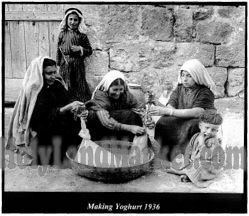 Jerusalem - The life of photographer Kevork Kahvedjian totally changed one day in 1989, the when his wife Hasmig decided to clean out the attic of their house in the Armenian quarter of Jerusalem’s Old City. There, to his amazement, she discovered boxes upon boxes of negatives of photographs that Kevork’s father Eli had taken of Jerusalem in the 1920’s, 30’s, and 40’s before the the city’s landscape had forever been transformed by the 1948 War of Independence. Kevork’s father Eli,, who was born in Turkey in 1910 and orphaned at the age of five was eventually rescued and brought to live in Palestine in 1920. He began taking his first photographs of his adopted homeland at the age of 14. In 1947, fearing the coming war for Israel's independence, Kahvedjian hid his entire collection and fled the country. 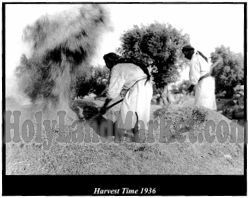 There the historic photographs remained hidden until some 40 years later, when Kevork and his wife found them. From the moment the discovery was made, Kevork Kahvedjian recognized the rarity of of his father’s photographs, and realized that his own life’s work would be to catalogue and exhibit them. “There is a lot of interest in my father’s photos,” says Kvork, whose two sons are also photographers. Photography is a life-long passion that Kevork says seems to flow in the family genes. The collection of Eli Kahvedjian's black and white photographs capture the ebb and flow of daily life in Jerusalem, and reflects the eye of an outsider, an Armenian Christian, living in the heart of a conflict between Jews and Arabs. The photographs have a sensitivity fostered by the hardships of Eli’s own childhood. “ One hundred and sixty members of my father’s family were murdered in the Armenian Genocide. After weeks in the dessert, my father was given to Kurd that was passing by. The Kurd sold him to a blacksmith, who eventually sent him away. He sought refuge in a Syrian convent. 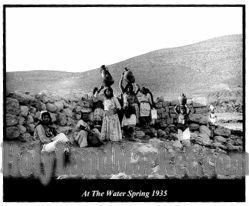 When the war was over, [in 1918] the American Near East Relief Foundation began to gather Armenian orphans and distribute them in its orphanages throughout the Middle East. My father was sent to an orphanage in Lebanon, and then Nazareth before arriving at the age of 16 to an orphanage in the old City. It so happened that one of his teachers in the orphanage in Nazareth was a photographer and started to teach him,” says Kvork. 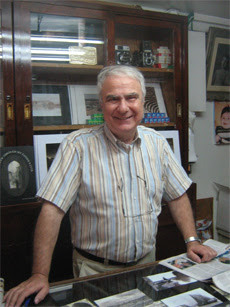 After learning the trade, Elia Kahvedjian bought a studio in 1936 on Jaffa Road ( which today is the site of the Dan Pearl Hotel). Elia had some business contacts with the British military, and as a result two British Intelligence colonels came to his studio in late 1947 to warn him of a pending Arab riot that destroyed the new Commercial Center after the United Nations vote on November 29, 1947, to partition Palestine. The two officers assisted Kahvedjian in loading his photographs and equipment on two trucks and transferring these treasures to the Armenien Convent in the Old City. A mere two days later, the studio together with all of Jerusalem’s Mamilla area was ransacked. Kahvedjian and his family also sought safety in the convent and fled to Syria for eight months. He returned to Jerusalem to find it divided between Hashemite Jordan and the newly established State of Israel. Kevork is currently completing a second volume of his father’s photos, and has begun cataloging over 2000 negatives his father shot in neighboring Middle East countries before 1948. His two sons are working on a “Then and Now” volume contrasting the changes in Jerusalem that have occurred in the last seven decades. “I have a lot of work ahead of me,” Kevork says. 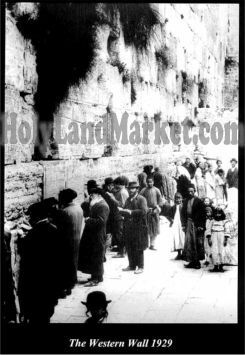 It's very interesting to see that men and women prayed together at the wall. That answers a question I've wondered about. Traditions have changed for sure. I'm so enjoying your blog posts. Thank you. Thanks Roxanne! So glad you have joined us! Let us know if there is anything you'd like to 'see' here!